My website has been moved! Please visit the new site at http://www.zoiehoffman.com! As we have all seen in our chosen field, most jobs are multi-dimensional in ways that others may not see. It may be hard for people in your workplace or community to see the depth and breadth of what you do each day unless they are right beside you. I know that this is true for my profession as a tutor. Even my students- whom I work quite closely with, may not realize what a tutor’s job entails. 1. We create learning experiences. This may be the most obvious job description. But notice that we do not just create learning- or worksheets, we create experiences. When a student experiences learning, the learning is much more likely to stick with them. A great tutor will go to great lengths to incorporate something a student enjoys in a learning experience. A lot more than book smarts goes in to being successful in academics. Tutors know this, and commit themselves to coaching their students in all areas that will increase academic success. Just like a sports coach, I often give my students talks on pushing themselves, goal setting, grit and other important qualities. Tutors are there for their students when the score is down at halftime with a pep-talk and a new strategy. It is our job to add ourselves to the sidelines of our student’s education along with their parents and teachers. We learn to speak compliments and encouragements as a second language. Letting our students know what they are doing wonderfully makes them trust us to help them improve. Our clients at times come to us because things just aren’t working. It is sometimes difficult to find where a child is struggling in a subject, and that can be frustrating to students and parents. Tutors are there to help sniff out what a student might be missing as well as anything else that might be keeping them from reaching their full potential. We spend lots of time thinking about our students and their problems. It does not just stop at the end of our session, we often stay up trying to figure out how to help a student get past a learning block or fill in a learning gap. Some tutors are in business for themselves. This adds to their workload, but it gives them much more freedom to work with parents to do what is best for their students. If a tutor is not attached to a big tutoring company this means that they are most likely doing the “business side” on their own. Always keep in mind that a tutor who is not attached to a company must pay taxes on what they earn, and purchase their own supplies. This may affect the rate they must charge in order to keep their business floating. Though most of us may not be a student in the traditional sense, we are constantly learning. We read books and articles daily to make sure that we are keeping current with what is happening in our field. If we have a student who possesses a problem we have not seen before, we find information and study in order to provide the help needed. My night stand looks like the nonfiction wing of the library. I recently had to readjust my stack so that it would not fall over. Last, but certainly not least we are committed educators. Most people only think about classroom teachers when this word comes up, but there are many professions out there that are occupied by educators. We teach our students in every way that we can. We want them to learn, but to also love learning. We put our all in to every day and every student in order to better their education. I feel that the title of educator is a sacred one, and that anyone who assumes it commits themselves to selflessly providing learning to their students in any way that they can. I am infinitely passionate about my job as a tutor, and I hope that this list helped you understand why! Keep checking back for my next post. I will be tackling reading comprehension. Continue to learn every day! Your child is stressed about school and their homework, it stresses you seeing them this way and you are at your wits end with what to do. You feel like you are failing in helping your child with their education, they get frustrated every single night and it doesn’t seem like anyone is learning anything. Your child tells you that they are “stupid” and “dumb” when you are doing homework or learning with them and 9 out of 10 times one of you ends up in tears. Homework and studying assignments seem to take all evening and there is little time left for play or activities, you can see the toll that it is taking on your child. If any of these are you, you are not alone by a long shot. The school year is officially in full swing along with all that goes with it. It can seem like more homework and study material is coming home every day, juggling this with all of the other activities and obligations your family has can bring the whole “learning at home” thing in to the pulling-out-your-hair category very quickly. So the question is, what do you do when learning, homework and everything else isn’t fun anymore? When its not fun anymore…for anyone…especially your kiddos…your face may look a little like this.. I can guarantee you there are many other parents in the word with that exact expression on their face at this very moment. It is normal to feel overwhelmed and exhausted, especially as schools assign more and more homework and projects. Your child is expected to sit and focus for hours at school, this can definitely lead to fatigue and the inevitable breakdown when it comes to homework. What are you to do? Every situation is different, but there are things that you can try to alleviate the stress and strain that school work and studying is putting on your family. This is also a great opportunity to teach your child skills that will help them as they grow in to adults. Think about the stressful situation on your plate right now- teaching your child proper coping skills will help them navigate those waters as they become older. If you have decided that something needs to change in order to keep everyone sane, try some of the suggestions below to make homework time smoother for everyone. When I work, I have a corner of my home that I go to get things done. It is, tucked in our guest bedroom with a small desk and most of my tutoring supplies at hand. When I sit down in my little work space I feel that it is time to do work, there are limited distractions, and I am not in view of the other pressing things that need to be attended to (piles of laundry, dishes, dirty floors ect.). A similar working environment for children can be very beneficial. Your child does not need a home office dedicated to their studies, just a small corner will do. The goal for this space should be for it to have most supplies that your student might need for their work at hand and limited distractions. If homework is done in the “designated homework area” every night, your child may feel more productive in this area due to its association. Having supplies gathered in one spot may also shave time off of the homework experience by avoiding the “why don’t we have any pencils in this house?? ?” panic. It is always a good idea to set a timer for a few minutes to ensure that the brain break does not go too long. Experiment with playing background music for your child as they complete their homework. I suggest music with mostly instrumentals. Try the Mozart station on Pandora to begin or explore other composers (my favorite is Johannes Brahms). Music helps the brain concentrate and can help drown out any distracting background noise in the home. Bonus- your child may begin to develop a appreciation and enthusiasm for classical music if they don’t already. As I write this blog post, my phone sits on silent, in a different room, with the door shut. It is hard for me to focus on the task at hand when it is so tempting to pick up that little screen to see the latest post..tweet..text..insta..ect. Your child may need to use a computer, phone, or tablet for their homework. (More and more teachers are integrating the internet and devices in to their curriculum which it’s about time for them to do!) The electronic use that can be helpful to avoid during homework time is the phone that sits at the right hand. When your child can hear their device alerting them that someone has messaged them, or has done something on a game, it can derail homework and their concentration very quickly. Sometimes homework time is difficult because a child does not understand a concept and it is hard for the parents to explain in a way that makes sense to the child. This usually happens with math or science concepts. For these situations I usually suggest popping over to Khan Academy. The site has great videos on a wide variety of math concepts as well as concepts from all other subjects. The videos and modules often include quizzes so that your child can practice what they just learned. Not all children can learn by listening and watching a video. If Khan Academy or similar strategies are not working, consider contacting your child’s teacher or tutor who may be able to assist you in helping your child understand the concept. Shout out math problems, every time your child gets a correct answer they shoot a hoop or kick a ball. I hope that with these suggestions, what was not fun anymore can become enjoyable once again. In the stress and strain of homework time a few changes can make a BIG difference. What adjustment during homework time has worked for your family? It feels like we just headed back to school, but time is flying and report cards are already making their way home. This can be a stressful time for students and families, when the first indication of how a child is doing at school becomes apparent in ink. As a child enters a new grade, it can be hard not to be shocked by what is coming home on the first report card. You know that your child is smart and that they have succeeded in the past, but maybe this report card is sending red flags and you don’t know what to make of it. Instead of letting this one piece of paper set your household in to a tailspin, there are a few things that you can do to set your child on the path to seeing better results next grading period. It is always important to remember to encourage your child, even when they bring home grades that are undesirable. As adults we have seen our fair share of failure, and have used that failure to direct our efforts and teach us lessons..this moment is a perfect opportunity to share insight about moving on from failure with your child. After having this chat, consider some of these options to to set your child on a better path for next grading period, and/or find out what is really going on behind the grade. Talk to your child about the report card and see what they have to say. They may be just as surprised as you are, or they may not be surprised at all. Ask them how the subject is going in school, what they feel like when they are in class, and what is going on around them when they are learning. It could be that they sit next to someone who is too noisy for their concentration level, can’t see the board, can’t hear the teacher, don’t understand the material or a number of other things. Your child may tell you something that gives you really great headway on how to help remedy the situation, or something that you can discuss with the teacher to find a fix. Maybe you find out the reason for the unexpected grade is that your child didn’t do all of the homework, or that they did not get enough practice with the material to master it. You can help your child set a goal to fix the problem, and then hold them accountable for reaching that it. This may even be a good time for you to set a goal that your child can also hold you accountable for. Make sure to discuss and write down the steps or behaviors that will need to be accomplished in order for the goal to be reached. For example, if the aim is for your child to complete 95% of the homework assignments and get them turned in, the steps or behaviors might be: Get the homework folder out and complete all assignments right after school. Let someone in the family check or look at my homework. Check to make sure all homework is back in my bag before bed time. Hand in my homework when my teacher asks me for it. Sometimes writing steps down can help a child see that accomplishing their desired behavior is achievable and also can help them remember what they need to do. After setting the goal, show support for your child by asking them “How can I help you reach your goal?” or “How can I help you be successful?”. These questions help you show support, while still keeping your child responsible for their own goal. Obviously, your assistance depends on the age of the child. Reach out to the teacher and see what they have to say about your child’s grade. Since the teacher is the one who is up close and personal with your child’s school work, they may have some insight as to how to remedy the situation. You can also communicate to the teacher what your child feels they are struggling with in class. Collaborate with the teacher to see what you need to be doing at home, and they may decide to also do something different with your child based on your insight as well. Make sure not to sound accusatory or blame the teacher for your child’s grade or performance. Also remember to give the teacher a few days to get back to you after you first reach out, report card time can get VERY busy for teachers. Chances are there are some other parents also contacting the teacher with concerns. 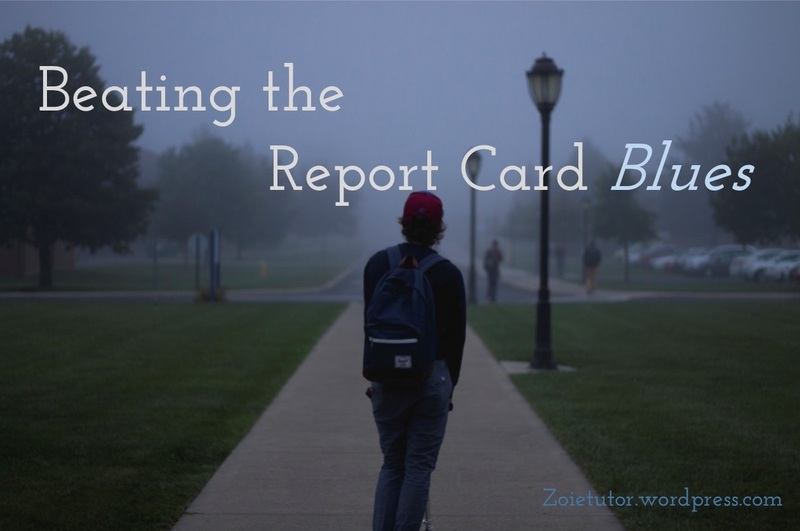 Sometimes the report card can be a sign that the routine is just not working for your child in the same way that it did last year. The new demands of a new grade, or extra after school activities may signal time for a change in the routine. Consider changing the time at which you do homework. Maybe your child will get more done if they do homework right after school, while they still have momentum from the school day. Alternatively, you may discover your child gets more done if they have a 1-2 hour break to clear their head and recharge before they try and tackle their homework. If homework isn’t the issue, consider bed times, breakfast, or nightly routines. Play around and see what is going to work best for your family this year. You may find that your child has gaps in their learning that are making it hard for them to succeed at the level that their grade is currently working. Or your child may need more practice with subject matter than they are getting at school. Seeking help from a tutor can be a great option for students who need extra practice, or who need to fill in gaps in learning. A tutor is able to help your student learn in ways that work for them and create activities and practice that cater to your child’s learning style. When I am first meeting with clients, I always make sure to ask what specific areas the parent is worried about in their child’s academic progress. Make sure to communicate with your tutor often to ensure that everyone is on the same page. A tutor can help your child in a way that can greatly impact their experience and performance in academics long after tutoring sessions have ceased. There is no guarantee that these suggestions will work in your individual situation, but I have found that they are always a good place to start. When dealing with your child’s academic struggles remember that you are not alone. You have a community of teachers, tutors and mentors right around you. I have a confession to make…I haven’t always been the voracious reader that I am today. Though it may come shocking to some people that know me, as a child I came pretty close to hating reading. Yes, I know that hate is a strong word, but as a young person I probably would have told you that I at least “did not like reading..at all..period”. I did not find reading books enjoyable, and I for sure was afraid of reading out loud in class. Many things contributed to my fear and distaste for reading in my childhood. In general I think I felt that I was not good at reading so I did not feel like trying. I also never was guided to books that I was interested in. It took me until my Junior and Senior year in high school before I discovered that reading wasn’t that bad..that reading was actually THE BEST. It took me having friends that guided me to books they thought I would enjoy, and me enjoying those books enough to work though the reading skills I was struggling with. One of the reasons I became and educator was to make sure that this didn’t happen to as many children. When I think back to the years when I “did not like reading..at all…period” I tend to feel sad. 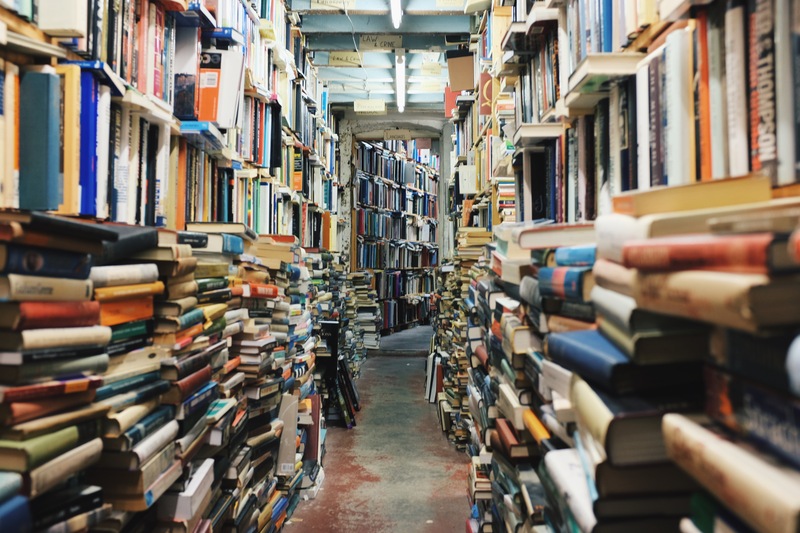 Reading has become an oasis for me that I use to help relieve anxiety, as well as for entertainment and stimulation as a curious adult learner. Sometimes I think about how much more I could have enjoyed and learned if only I had started at an earlier age. If your child does not show an interest in reading it is completely normal. The good news is there are things you can do alongside their teachers, tutors and mentors to help them become interested and aware of the joy and importance of reading. Please do not misunderstand, I have not performed any scientific research. I am not claiming that I am an expert or that I am an authority on this subject. These are simply methods that I have seen work with some children. This may seem like a no brainer, but I know that it is also harder than it sounds. Everyone is busy, especially during the school year. Try to make time to pick out books with your child that they would like to read and read them together. This doesn’t have to be a bedtime routine, this can occur at any time during the day. You might even find it helpful to keep the book with you as you go about other daily routines so that you can find small times before sports practice or while waiting in lines to read with your child. Kids always want to be like their parents. They idolize you! Not only will they repeat what you say, they will also repeat what you do. If your child sees you reading on a daily basis they will also want to read. Keep some books, magazines or newspapers that you are reading laying around the house to remind you to read them in a place where your child can see. In America we have a mentality that quitting is bad. I have started to realize that this is not always the best mentality to have. Sometimes we just need to acknowledge when something isn’t working for us. One of the reasons I didn’t enjoy reading as a child was because if I wasn’t enjoying a book, I felt like I needed to slog through it anyways. Now however, I probably abandon a book per month. If your child has tried the book but cant “get in to it” or is not enjoying it, encourage them to put it down and make a different selection. Kids can ask a LOT of questions. They are trying to find out everything about the world around them, and they can become curious about subjects that you would have never guessed they would even think of. When your child asks you a question, help them look for the answer in reference books or on the web. If you are worried about web searches, you can do your own quick search and then print articles to read with your child. Make sure that there is plenty of reading material around the house that your child can pick up. Books are expensive, and your child’s reading level changes quickly sometimes, I know. If you have a public library close by, see if you can make a routine of going with your child to pick new books ever couple of weeks. This helps you keep new and interesting books around without breaking the bank. If you do not have a public library close by, see if you can set up to exchange books with other families in your area every couple of weeks. Having lots of reading material around will increase the chances your child will get hooked on the perfect book! Try one of these methods next week and see what it does to your child’s view on reading. Always remember to keep reading a fun and relaxed experience whenever possible. Fall is approaching quickly! I get excited thinking about the crisp air, football, holidays and as always back to school time. Okay..well the air doesn’t get so crisp here in Florida at first..but by darn that wont keep me from enjoying it. Along with fall it seems comes a lot more “busy”. With the end of the hot lazy summer days comes the beginning of school functions, sports practices, scouts, church choir and so may other commitments. 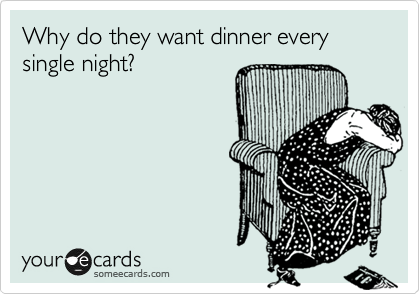 So now that it is fall you are driving around, helping with homework (and more homework) and somehow are still expected to have dinner prepared. It may seem like there isn’t much time for those fun learning activities you were doing with your kiddos over the summer. But there is hope! You may not have as much time to sit down and play math facts games but you can squeeze in some fun learning while you are scurrying around town or in the kitchen. Below are five ways to squeeze in some learning and family while going about your busy routine! Though they may not be intensive practice, they do have lots of benefits that will help your child in school and in life. I don’t know about you, but I make TONS of lists every week. Without them I become lost and overwhelmed with life. You can ask my husband..without a list I am a zombie wandering around our house with wide teary eyes and no sense of direction or productivity…its bad. So you will always see me with a list of some kind in my hand! 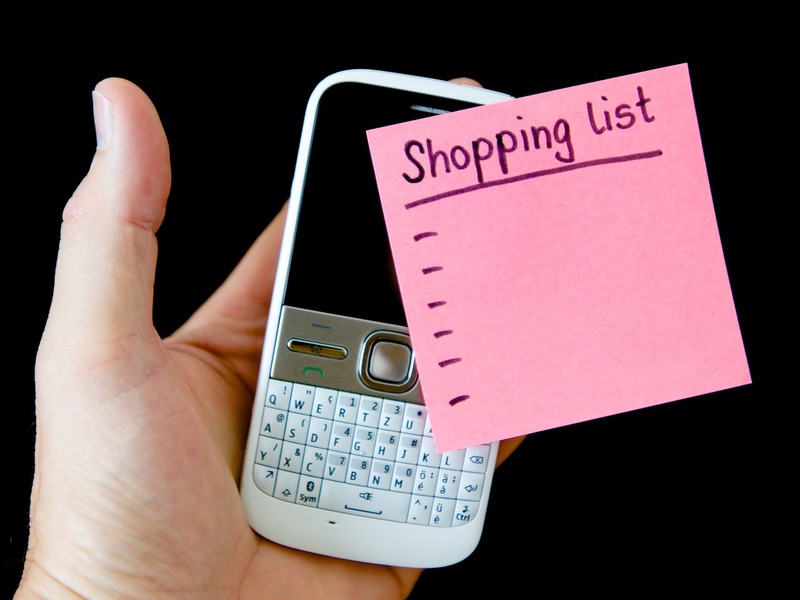 We all make at least a few lists from time to time for groceries, shopping or other tasks. When making lists, one easy way to promote learning is to get your kids involved! Pre-Kindergarten– Have your child help think of things to put on the list..or they can write their own to take to the store with them. After they write the list, ask them what they put on it (warning: it could get fun). This will help your child with their verbal communication skills as well as their knowledge of writing. Young grades– Your child can help write the shopping or to do list. Don’t worry too much about spelling (unless they are spelling words for school) just encourage them to write. This will help them become confident in their writing and show them practical uses for what they are learning in their school writing. Older grades– Have your child think up and write the list, ask them to figure out a way to categorize it or streamline it in some way while they do it. This will help them with their processing skills as well as fine tune their spelling and handwriting. While in the car, around town, or at home make up math problems for your child that they can do mentally, and let your child do the same for you. You can use your surroundings for inspiration or anything that has happened that day. Don’t be afraid to get super silly or to challenge each other! A few times a week have your child assist you in the kitchen. This is a great bonding experience as well as an opportunity for your child to learn SO MUCH while having no idea that they are learning. As always, exercise caution with kiddos in the kitchen and don’t give your child a task that you do not think they are ready for. Pre-Kindergarten– Have your child help you measure ingredients. This will make them aware of the math and science that goes in to measuring. Also, read the recipe out loud and have them watch you or help you follow the instructions. This will help your child to better process verbal instructions, which is a good skill to know for kindergarten! Young grades– Read the recipe with your child or let them read it to you, depending on their reading level. You can point out sight words or spelling words that they are learning as you go along. Go back and forth between the recipe and the food prep to show them the correspondence between the numbers and action words and what you are doing. Older grades– Have your child read the recipe to you. Measure the ingredients with your child and let them do some of the prep work if you feel they are ready for it. You can also flip this and read the recipe to your child and have them follow the instructions to measure and prepare ingredients. This will help with following verbal instructions which is a valuable skill! We’ve all solved that problem about the hot dogs and the buns right? It’s weird that hot dogs and buns come in different quantities per package and this has proved to be a great math problem for the third grade. The truth is, word problems usually focus on things that could happen in real life. If you start to think about this you might be able to find “word problems” everywhere you go. Just the other day we were having a group of people over to our house for tacos. While standing in the isle deciding how many taco shells to get..and what combination of boxes (they came in 12 and 18 packs) in order to have just the right amount for our party I literally exclaimed “WE ARE LIVING A WORD PROBLEM!”…but really though.. Try having your child help you decide on things like taco shells or other items that you need for your household. When going to the store you can also tell your child how much money you have and then have them help you decide what items you can get to get closest to the dollar amount without going over. The possibilities are endless..so just play with them! This is probably my favorite one. I know not everyone does, but I have a tendency to narrate my life..and maybe make it a little more adventurous in my mind narration than it actually is. When riding in the car or doing day to day things with your kiddos, make up a story with them about what you are doing or things that you see. The story could be a stretch on the actual events taking place, or completely made up. Even though it doesn’t seem like a whole lot of learning, telling stories helps kid’s imaginations, their flexible thinking and many other skills that will help them become better writers. Step Away From the Flashcards! Like most people in America I like to visit this magical land they call Target ALOT. This summer especially has been filled with hours spent in Target with my husband “remembering” things we “need” for our new apartment. This month especially, I feel an extra jolt of excitement as I enter Target. It is back to school season and I know that I will get to roam all of the pretty school and learning supplies at the back of the store. This season though, my jolt of excitement has been crushed as I walk in those magical sliding glass doors and immediately see a WALL of flash cards in the entrance to the dollar section…my favorite section! Why is this crushing my Target spirit? Because, in most cases there are MUCH better things you can be doing with your child to enhance and increase their learning than drilling them with flashcards…and they take just about as much effort. When I was in elementary school there was a lot of emphasis on rote memorization. I think I still have nightmares about the speed addition and multiplication tests that I was given. Thankfully now the standards focus more on understanding and critical thinking when it comes to all subjects, especially math. When I was taking those speed math tests, I didn’t really understand what the numbers meant or why 5×6 is 30. I just knew that 30 was the answer on the flash card I was given. Luckily this is not how things are done in most schools now! You can help your student a lot by helping them with activities and games that concentrate on their understanding rather than their memorization. Below I have listed four things you can try with your student in place of math flash cards. There are lots of card game ideas out there on the internet that will help students practice math concepts. The greatest thing is that playing cards are so cheap and most people have them at home already. Playing cards are not limited to one activity like flash cards are, which is even more fun! 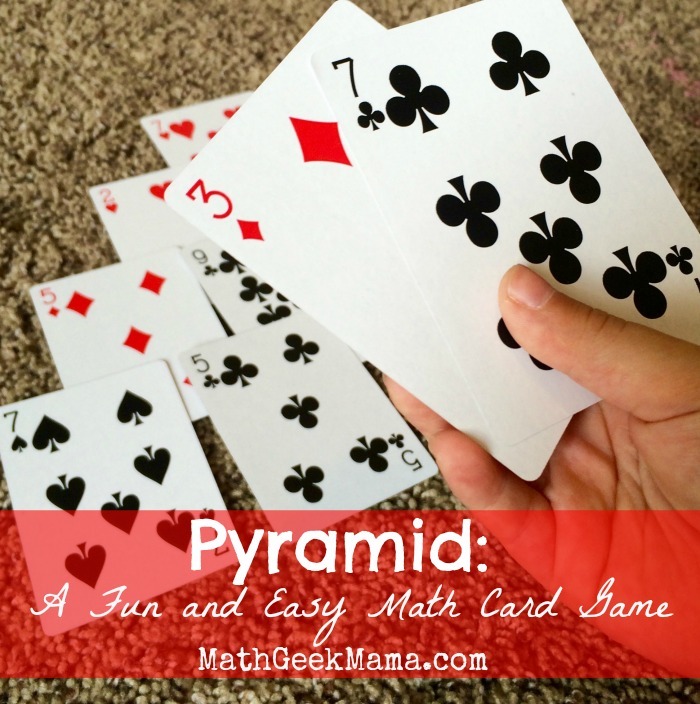 You may even know some card games already that will help your child with math concepts. The game Pyramid is super simple and super fun for younger grades and parents to practice making sets of ten together. I found it on Math Geek Mama which has some great math resources for teachers and parents! 2. Break out the white board! Kids are some of the most creative people I know. If you have a white board, chalk board or other erasable surface in your home it is a great way for your student to be creative while practicing skills! Instead of spending time with flash cards, spend the same amount of time giving each other problems to solve. Most students love to show off their skills while being able to draw and erase. Of course there is always free draw for a few minutes at the beginning and end in my tutoring sessions..because who doesn’t compulsively want to draw every time they see a white board? Or is that just me? Instead of asking “what is six plus seven?” try asking “can you show me six plus seven?”. You might be surprised what your student has to show you! If you want to, you can move on from the answer and ask follow up questions such as “could you find two more numbers that combine to make that same answer?” or “what is another way you could solve that?”. Have fun and let your student ask some of the questions too! This goes along the same lines as the card games. Dice are a fun way to practice math facts up to six! 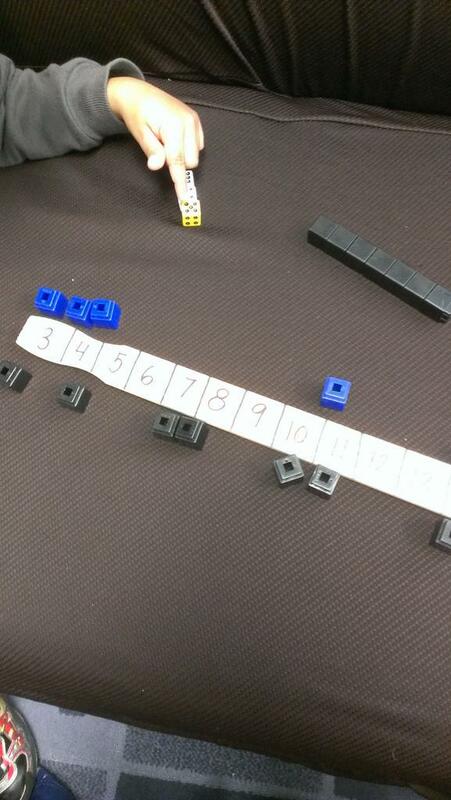 If you are working on addition you can get out two or more dice per person and have a competition to see which person rolls the highest number. You can practice multiplication by rolling two or more numbers and then multiplying them. The possibilities are endless, so play around with it! There are also lots of fun dice game sheets on teachers pay teachers if you search for them. My personal favorite dice game is “walk the plank” you will have to acquire a paint stick to play it, but you definitely wont be disappointed! The Primarily Speaking blog explains how to set up and play the game really well. Instead of using cubes like are shown below, you could always use coins, soda tabs, milk caps or anything else you have lying around. 4. Break out the electronics! Let’s face it, we are smack in the middle of the digital age. Sometimes it scares me how much our phones, tablets and computers can do…but they are SO GOOD for learning! Especially since we all seem to be getting busier and we take our devices everywhere! Spend an evening on your device looking at the app store and searching the skill you want to review with your child, chances are you will find something fun. I could do a whole blog post just about fun learning apps! There are tons of blog posts already floating around out there about learning apps that you can explore. One of my favorite ipad games is Sushi Monster. You can use it for multiplication or addition. 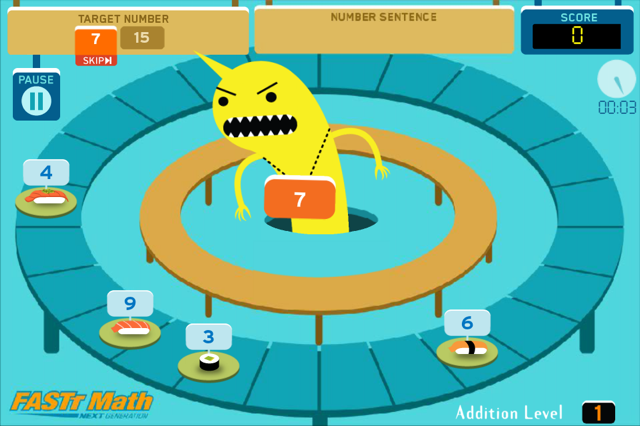 A monster sits in front of a sushi conveyor belt with a number around his neck, the point of the game is to pick numbers off the table in front of him that add or multiply to that number. The game is bright colored and super fun! Even though the game is focused on fact fluency and remembering facts, it still promotes deeper thinking because there are multiple ways to get the answer. So there you have it! Obviously there is a time and a place for flash cards or other rote memorization techniques, and every child learns differently. I am not claiming that these activities are an end to flash cards..I’m just saying they are fun, engaging and more thought provoking ways to approach math practice. No matter what you are doing make sure your student is understanding the math that they are doing and that they are thinking deeply about it. Try something new out this week in place of flash cards and comment with your experience. What activities do you like to do with your student to practice math or another subject?